Love plants and flowers but don't have a green thumb? Here's a gardening activity for the whole family, and you're guaranteed to grow beautiful blooms of all sorts! 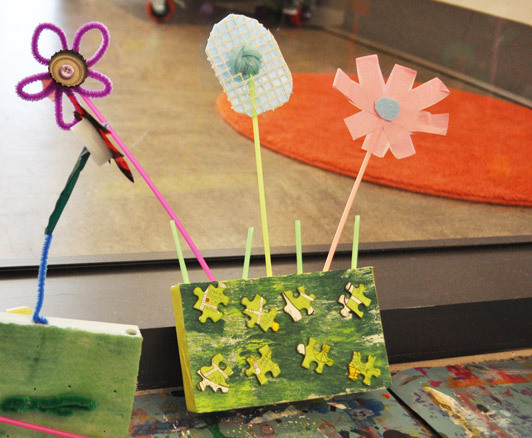 During the Every Day Art Project, From Found Materials to Flowers here in The Studio at The Carle, guests creatively used an array of found materials to create their own mini flower gardens. The green garden bases are sheets of insulation board from Lowe's painted with green acrylic paint to look like grass. We used wires, chenille stems, chop sticks, popsicle sticks, coffee stirrers and toothpicks as stems, and lots of other things for branches and flower petals. We recommend using a thick craft glue like Aleene's brand, or hot glue to attach your pieces together. Children should always be supervised by an adult when using a hot glue gun. Want to make a garden but don't have any materials on hand? Collecting your own free recycled materials is easy. Try keeping a container next to the kitchen sink so you can easily set aside bottle caps and lids; wine corks and colorful plastic fruit netting; junk mail envelopes and foam scraps; and twist ties and bubble wrap. Pretty soon you'll have a found materials collection ready for the next time your family's mood strikes. Collecting more materials than you need? Ask your child's art teacher or day care provider if they need any clean found materials for art projects. This entry was posted on Monday, June 3rd, 2013 at 7:00 am and is filed under By Diana MacKenzie, Every Day Art Program, Found Materials, Mixed Media, Nature, Sculpture. You can follow any responses to this entry through the RSS 2.0 feed. You can leave a response, or trackback from your own site.